Your retirement should be the time in your life where you get to relax, where you get to spend time with the people that mean the most to you while you do the things that make you happy. Many people assume that as long as they have contributed to their retirement plan regularly and that they can apply for and collect social security and Medicare, that their retirement will be smooth and easy. While we wish that was always true, it isn’t. 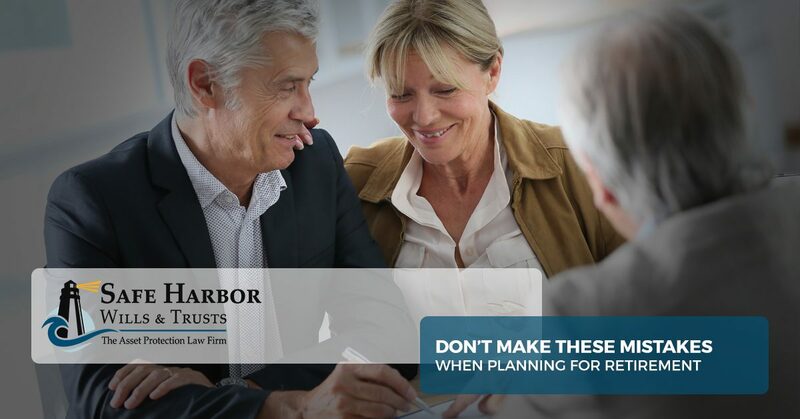 To avoid running into problems during your retirement, you will want to avoid making some common asset protection and retirement planning mistakes. At Safe Harbor Wills & Trusts in Syracuse, we offer legal services to anyone who wants to protect their assets and prepare for the future. We have years of experience helping people create trusts, draw up wills, and otherwise protect their assets. If you are having problems applying for Medicaid or you are in the middle of an elder law emergency, please call us right away. We want to help you have the kind of retirement that you have always dreamed of. If you and your spouse have been working steadily for decades, it is easy to assume that you will have enough social security and retirement money to live off of. DO NOT make that assumption, because it could end up costing you everything you have worked for. The rising costs of medical and long-term care are increasing dramatically year after year, and without knowing what the future could bring, you risk not having enough to handle an emergency. One of the most important functions that a lawyer can serve is to help you find ways to prepare for the future today. By protecting your assets now and into the future, a lawyer can help find the best options in order for you to retire the way that you want to. While you may be healthy and happy as you near retirement, you shouldn’t believe that things will always be that way. As you grow older, the likelihood that you will get sick increases. Other problems, including a death in your family or a divorce, could also create financial problems that destroy your previous plans. It is a good idea to speak to a qualified lawyer each and every time you experience a significant life change. If you get divorced, talk to your asset protection lawyer. If your spouse or one of your children or beneficiaries dies or becomes unable to care for themselves, talk to your asset protection lawyer. If one of your children gets divorced, talk to your asset protection lawyer. We don’t want you to become a pessimist, but a degree of skepticism and concern about the future is healthy and smart. If you start to prepare for the worst now, you will be ready in case it happens, and you won’t have lost anything if negative possibilities don’t materialize. Planning early and thoroughly can help cushion the blow of almost anything. 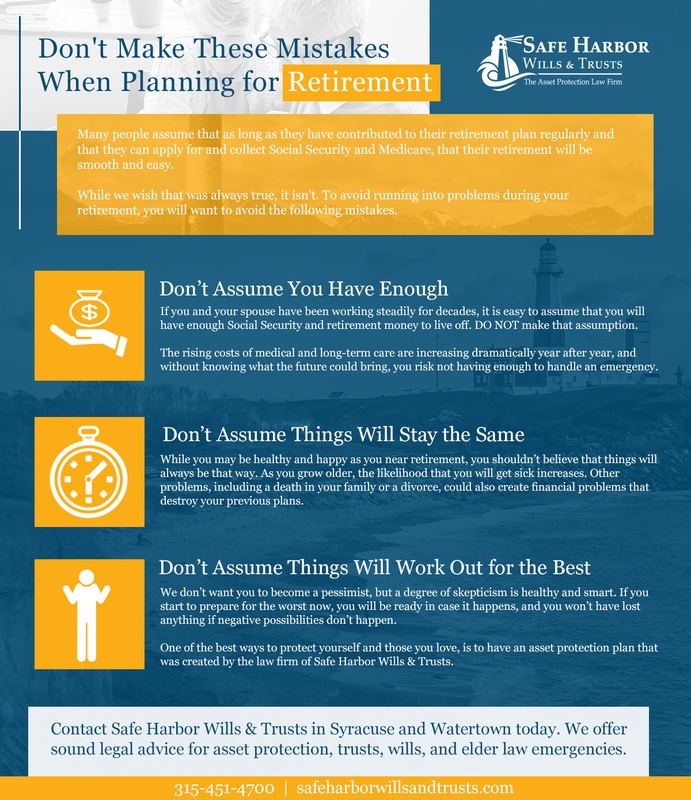 One of the best ways to protect yourself and those you love, is to have an asset protection plan that was created by the law firm of Safe Harbor Wills & Trusts. Contact Safe Harbor Wills & Trusts in Syracuse and Watertown today. We offer sound legal advice for asset protection, trusts, wills, and elder law emergencies. For years, we have helped the residents of the area prepare for the future. We regularly offer asset protection workshops, so if you are interested in learning more, please see when the next workshops are, and sign up to attend!